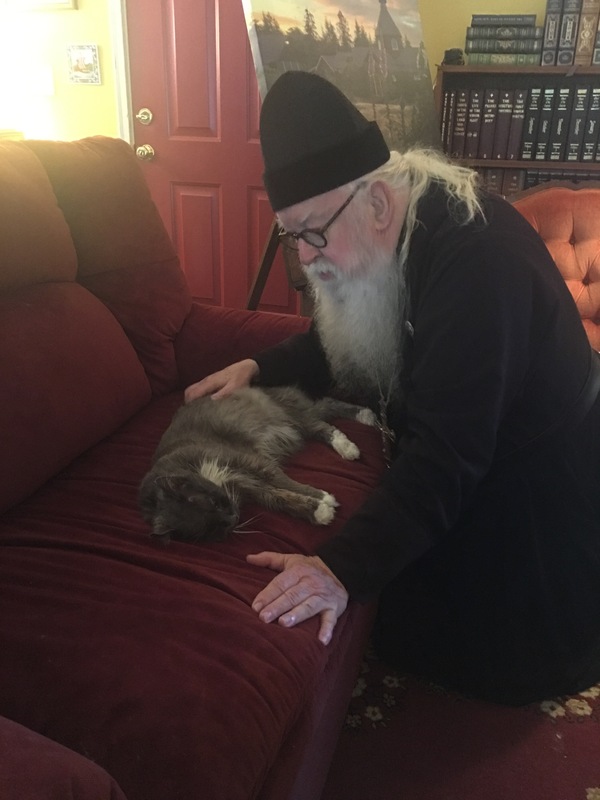 Our beloved Norwegian Forest Cat, Hammi, was most happy when the entire monastic brotherhood gathered together with him in our library/community room. We all considered him an important member of our community, and Hammi was the only cat I knew who had his own facebook fan page, started by a woman who’d met him on a pilgrimage to the monastery (if my memory be correct). I first met Hammi, a large male cat, as I was walking between our old trailer house (now gone) and my cell, some twenty years ago. We startled one another, but as I reached down with extended hand, he came to me. When I picked him up he began purring immediately, so of course I promptly opened a can of salmon, and he decided, then and there, to adopt us. A month after his arrival I took him to a vet to be checked out, and was told by the veterinarian this cat had likely been dumped by someone from Seattle, as happens frequently when people want to dispose of a pet, making sure the animal can’t find it’s way back home (impossible from an island). I often tell people that Hammi domesticated me, since I’d not previously been a cat fancier, being allergic to cat dander, as I am. Little did I know Hammi was a Norwegian Forest Cat, one of the few breeds that are nonallergic. Norwegian Forest Cats have a very soft, double fur coat, large paws, sweet facial features, and a very loud purr box. They are known to be personable, for they prefer being around people, as the breed was developed aboard Viking ships. Hammi greeted everyone who came to the monastery, escorting them up the steps from the parking lot. Everyone who’s ever met him, fell in love. I’ve lost count of the number of people who’ve stated they never liked cats, but now wanted to get a Norwegian Forest Cat, after meeting Hammi. Intelligent breed that they are, Hammi learned to let us know just what he wanted, be it water, food, cuddling, sleep, or just to be left alone. He was a great companion to all of us, even tagging along when one of us took a walk into the forest on the Valaam Trail. He and I had a special game which we both enjoyed. I’d head out on the trail with Hammi running ahead. He’ll hide behind a large fern, and even though I knew he’d be waiting ahead, when he jumped out he always managed to scare me. I’d then run ahead and hide behind a tree, jumping out when he walked by. We played this game until the end of the trail! Our pets teach us so much about unconditional love. I’ll never forget the day Hammi spotted our newly arrived Rhode Island Reds for the first time. He was sitting on the veranda of the trapeza with me and some guests. Hammi sat up when he spotted the hens, and started walking toward the chicken coop. I followed him, as did our guests. As we were standing by one of the hens, Hammi crouched down, ready for the kill. All that was needed was for me to say, “No, Hammi, they are our friends”. He turned away and walked back to the veranda, leaving me and the guests alone with the chickens. He never bothered them again. Over the years, there have been many occasions where we were all out, late at night, calling Hammi. We have Great Horned Owls, raccoons, mountain lions, bears, and who knows what, hunting at night, so we never allowed Hammi to be out after dark. If Hammi was not in for the night, I start praying for him. I am the one who let Hammi out of the library every morning, always waiting until daylight. Hammi would cuddle in my arms before I fed him, and let him outside, and I always gave him a blessing for the day. If a priest can bless cattle and bee hives, he can certainly bless such a wonderful companion as our Hammi! As a Norwegian-American, living in a monastery of Norwegian architecture, it seems clearly evident to me that God sent this Norwegian Forest Cat as a companion for His monks. We named him Hammi, because, from the start, he was a little ham. We had a veterinarian put our beloved Hammi to sleep, Thursday afternoon. This was a most agonizing moment for all of us, but the vet believed he had a brain tumor, which was likely the reason he became blind and deaf, and unable to withdraw his claws. We finally decided we didn’t want our beloved twenty-three year old kitty to suffer any longer. 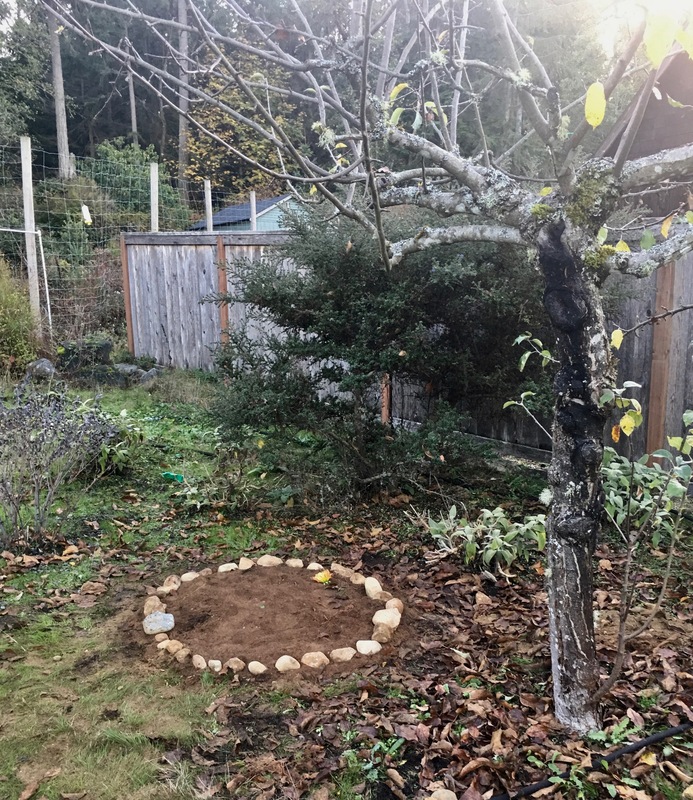 Reader Edward kindly made a casket for him, and we buried him next to one of our apple trees. I am personally going to find it difficult not having my little friend, and his unconditional love and companionship, in my life. I can actually say, my heart is breaking. 9 For God did not appoint us to wrath, but to obtain salvation through our Lord Jesus Christ, 10 who died for us, that whether we wake or sleep, we should live together with Him. 12 And we urge you, brethren, to recognize those who labor among you, and are over you in the Lord and admonish you, 13 and to esteem them very highly in love for their work’s sake. Be at peace among yourselves. 24 He who calls you is faithful, who also will do it. 27 I charge you by the Lord that this epistle be read to all the [b]holy brethren. Just after his death, I am holding Hammi for the last time. I am so sorry to hear of Hammi’s repose. He was one of the joys of visiting the monastery. I know what it is like to loose a feline that us part of the family. God comfort you all. So sorry to read of the loss of your beloved Hammi. I have enjoyed reading your stories of Hammi in Monastic Community. Thoughts and prayers for you and the brothers. So very touched by your beautiful description of this furry four legged creature of God’s .. Hanmi …that blessedyou with so many happy years and memories . I believe animals have a Godgiven way of touching & opening our hearts in a way that humans don’t … a different way , that shows us love transcends words. Sending much love & prayers for healing a broken heart . I am so sorry for the loss of your dear little friend, and my heart aches with you. I will be visiting Seattle next year, and hoped to meet Hammi if I have the opportunity to visit the monastery. Thank you for this lovely tribute for Hammi which brought tears to my eyes. I remember him well. Our dogs and cats can truly show God’s unconditional love for us. I hope you can one day find another Norwegian Forest cat although the unique Hammi is irreplaceable. I mourn with you and your family. I love reading stories about Hammi. So sorry for your loss! 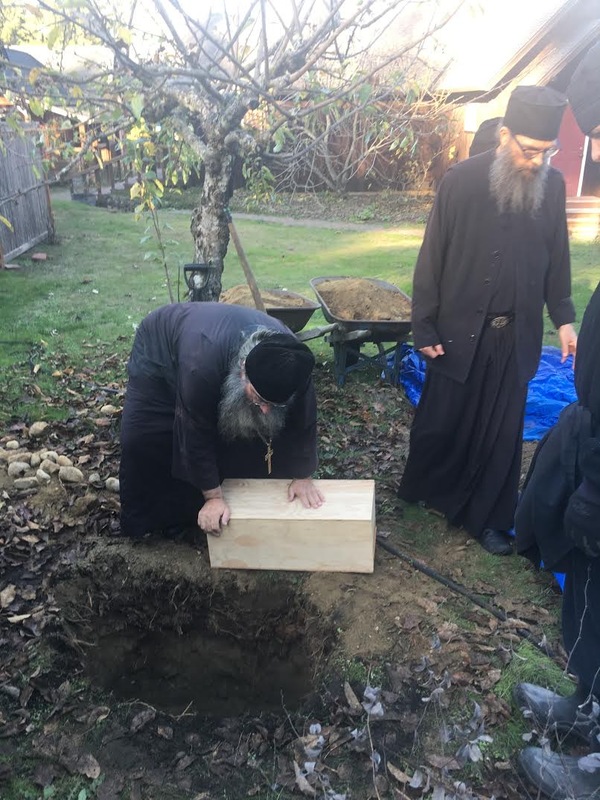 May Hammis memory be eternal 🙏What a beautiful gift he was to you and the Monastery. Thank you for sharing his story. May our Lord comfort you good men in your loss. Thank you for this piece Fr. Abbot. You have given me a whole new perspective on keeping a pet. I am so sorry Abbott Tryphon. God bless you all….. I feel your heart. We went through a similar situation with mouth cancer and our pet earlier this year. God gave us 2 extra years with him after he was diagnosed but eventually we had to put him to sleep. Cherish the memories of you furry bundle of joy. I am confident that God takes care of all his created. Thank you for telling us the story of your beloved cat. What a miracle. I am so sorry that you lost your dear friend Hammi. I too looked forward to any of your daily postings that that included photos of him. His passing will be a loss for all of us. So sorry and many prayers. I am in Montana having just attended my grandmother’s funeral after 95 years of life. A tough week. Many prayers for you. While you mourn, please remember the many people that get up every morning reaching for their phones looking for the Morning Offering. Thank you for what you do. Again, prayers for you and your beautiful Monks. May God bless you with a beautiful day. My heart goes out to you and your brothers about losing your beloved Hammi. I know how difficult it is to lose a pet. You are in my prayers. Would that death never was. Cats keep us humble, especially Hammi, it seems. When I visited the monastery with my friend, the first greeting we received was Hammi walking up to us in the parking lot. As Fr. Martin approached he gestured towards Hammi and said “I see you have met Hammi, he is friendly but ancient of days.” – One could clearly see that Hammi was very special. I shed tears of happiness for meeting him, and sadness in knowing that you have lost this special companion. Thank you, Abbot Tryphon for this post. I listen to your podcast and read your posts every day and derive great encouragement from them, but this one is particularly timely. I’m nursing my 17 year old Siamese cat, Lucy, through advancing kidney disease and know that our time together is limited. She’s been my constant companion since the death of my husband 14 years ago. (I was only 47.) I call her my “furry roommate” as Siamese are very interactive with their owners and actually “talk” back! I’m already experiencing anticipatory grief and sometimes reproach myself for it. That you say your heart is breaking goes a long way in validating my feelings. Pets are truly gifts from God and I’ve been blessed to share my life with four wonderful cats over the years, each one with its own distinct personality. May the Lord Jesus fill your hearts with grace and peace in the loss of Hammi. Having lost a couple of dearly loved pets myself, (dogs) I know the pain of losing a friend. Praying today for the Lord to comfort you all. I am so sorry to read of your loss of Hammi. I was privileged to get to know him when I visited you. He had a unique and unforgettable personality. It was obvious how much you and the other monks loved him and how much he loved you. Please be comforted by the fact that he spread great joy during his stay on Earth. Oh Father Tryphon, I am so sorry! The stronger the love, the greater the loss. May God show you his love and mercy especially at this time. Dear Abbot Tryphon, I am so sorry for your loss. Our pets are our furry family members, who do give unconditional love with their distinct personalities and Leave a void in our lives and a hole in our heart when they go. God bless you and thank you for being the kind and compassionate caretakers of God’s animal kingdom…especially dear dear Hammi, your faithful companion in Christ. I am very grateful for each one of you… and pray with you and for you daily. It is so hard to say good-bye to a furry friend. What a blessing it was that he lived to be 23! Thank you for sharing him with us all. A beautiful tribute to your special Hammi. Sorry to hear about your loss. But like I have emailed in the past, from the Psalms. God saves both man and beast. The teach a lot about love. I recently lost one of my cats, who would say my morning prayers with me. I am so sorry to hear about your loss! I know that Hammi meant a great deal to you and your community, and will be greatly missed!! +Rev. Dr. Emanuel S. Chris, M.D., M. Div. I just read your beautiful tribute and now my heart is breaking too. We lost our dear cat Pickles a few months ago, it is much more difficult than expected. No wonder God provided the animals to be with us. I pray that you all will be comforted; thank you for your daily thoughts as they are a comfort to me. It has always been a hope of mine, perhaps not theologically sound, of course, that we might see our beloved pets when we cross into Heaven. Our pets give us so much love, and they serve as the best of teachers at times. My most profound condolences for your lost, Dear abbot and brothers! Thank you for this beautiful respectful and appreciative message. A great thank you to God for blessing us with the beautiful gift of His creation. Until we meet again, we all love you Hammi. God bless you dear Father. May He help you get through this lost. I know it’s not easy. My spouse and I lost two beloved cats in the last 13 years. One was the first we bought together: our dear lilac Burmese cat called Pasha. He left us because of a stomach cancer at the age of 13 and a half in 2005. A few months later we bought two wonderful Tonkinese cats. We called the brother Nicky and his sister Alexie (those were the affectionate surnames that the last Russian Tsar and his wife used when writing to each other). We had to put to death our little beloved brown princess Alexie when she was eight because of an intestinal cancer. Her talkative brother is still with us, full of love and healthy (he has asthma but the Ventolin pump has been doing its job since he was diagnosed with that problem 11 years ago) and lovely and will blow his 13th candle December 10. These little creatures, God’s making and ours to care for and learn from, are true blessings. I’m so sorry for your loss of Hammi, and I’m grateful my husband, son, and I got to meet him when we visited. We will pray for you and the brothers in your time of grief. As soon as I read the title of your post today, my heart cried out, for I knew instantly what had happened. I am grieving with you. When my daughter and grandsons and I visited the monastery, it was a lovely visit, but with two disappointments: you were away, and we did not meet Hammi. Thank you for this profoundly moving tribute to a truly extraordinary cat and companion. 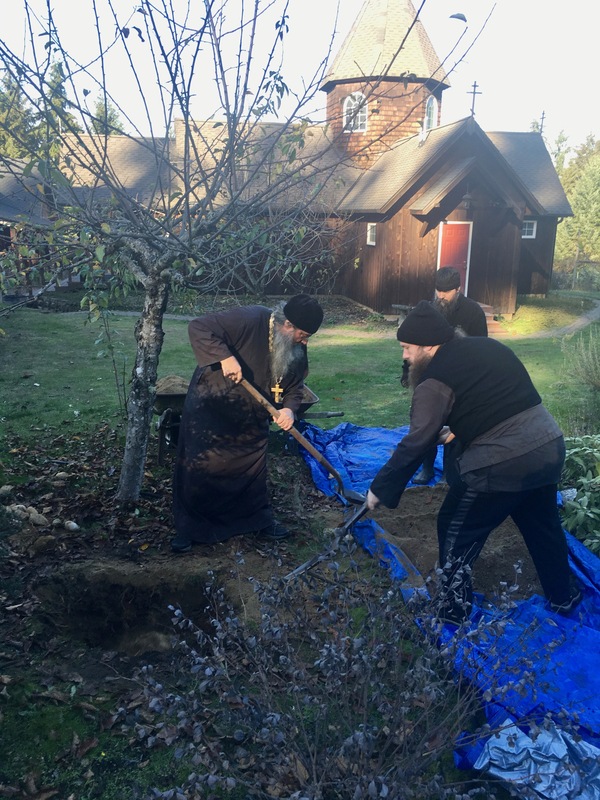 This is sad to hear; truly Hammi was a blessing from God in the life of all at the monastery. I wish I could have been able to see him before I left a few weeks ago, he was a very special cat. I send my sincerest condolences on the loss of your beloved Hammi! My heart breaks for you and I pray for peace and comfort in the days and months ahead. We, too, had to put our 19-year-old cat to sleep 2 years ago on Holy Tuesday. We all, but especially my adolescent children, were devastated. We had AFR on in the car as we were driving to Holy Wednesday services the next evening and your podcast came on. You were sharing your thoughts (and CS Lewis’) about whether or not our pets would be in Heaven with us. I almost turned it off when you started, because I didn’t want my children to hear that they might not be, but I waited. It was truly the most beautiful and Heaven-sent podcast at exactly the right moment for my children (and me!). We all found so much comfort in it and I silently thanked God for sending us your message at the very moment we needed to hear it. I hope you recall your words and find solace in them. We finally got another cat for Christmas last year and she is such an abundant source of unconditional love! May God send you another furry companion in His time. I am so sorry for your loss. It is heartbreaking to lose a beloved pet. Thank you for sharing what a special companion and friend you precious Hammi was to you and all. God be with you. My heart goes out to you as it truly is heart-breaking when we lose a beloved companion. Our furry friends mean so much to us – they teach us a great deal about trust, unconditional acceptance and love, and the privilege of caring for one of God’s amazing creations. As painful as it is when we lose them, the joy they give to us far outweighs the loss. May God bless you all in your sorrow . Father thank you for sharing your wonderful tales and heart warming pictures of your beloved Hammi over the years. They have blessed and brought joy to so many. I am so sorry for your loss. I too had to have our cat Albert put to sleep just a few weeks ago. He was 20 yrs old, and we had him 15yrs. May God grant life to the animals we loved in the world to come. I’m literally typing through tears……I’m so sorry for your loss. 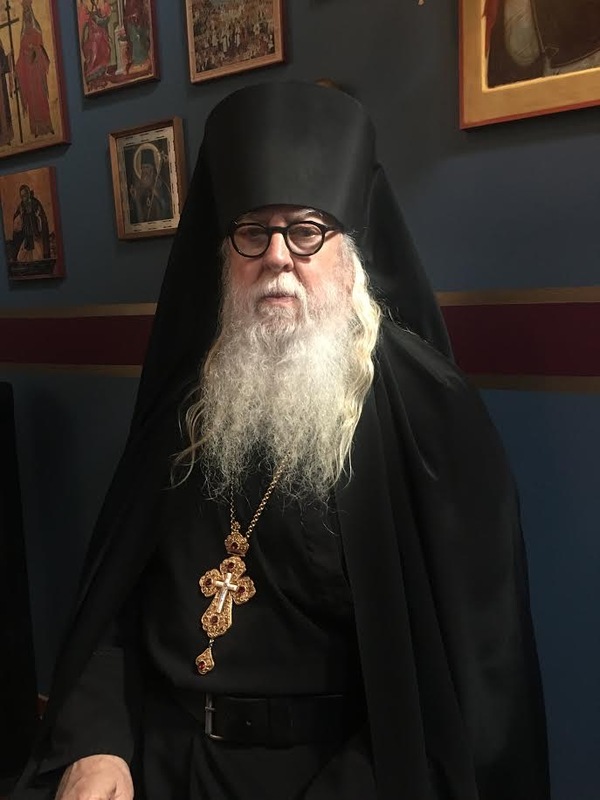 Abbot Tryphon, my heart is breaking with you as you mourn. I enjoyed reading about Hammi’s life and how you two would play games together. I pray that you will be reunited with your beloved Hammi in Paradise. As soon as I saw the title for today’s show I knew in my heart what it would be about. My heart grieves with you for the loss of your companion. You do not cry alone! Peace be with you! my son, my joy came from wonderful, white Weasle, mellow Misue and the fluffy, puffy, warm and cuddly shadow grey bundle of joy Fiffer–I feel so blessed to have been granted these gifts from God and still miss them everyday. I also thank God that each of them reposed in peace and I was not faced with the decision of having to put them to sleep. Many will call it sacralige, but I can not envision a joyous eternity without the precious, furry family members who were devoted to us and shared our love here on earth. I so feel your heartbreak; may God lighten your grief. I’m so sorry, for your loss, dear Abbott! It is so hard to lose a beloved furry member of the family. Please, accept my condolences. St Mark the Ascetic: Remembrance of God is pain of heart endured in the spirit of devotion. A beautiful tribute which brought tears to my eyes. Sincere condolences from this cat-lover in the UK. so sorry to hear this. Hammi surely was a special friend with a personality that came right through the screen in the photographs you posted of him. I saved most of the photos into Hammi’s own picture file on my computer. God is good – I believe, as you have written, that we will have our pets again; Paradise wouldn’t be Paradise without them. Hammi’s Memory will be eternal. The evening before I read your reflection, I read a selection of St. John of Kronstadt who said we should regard the “little beasts” in our lives with great care. It is clear that Hammi has received wonderful care and attention. I will ask for St. John’s intercession for you and the monks. Also, I am sure every pet owner who has read your reflection feels the heartache of your loss of Hammi. I know I do. I am cat owner as well. Thank you for sharing this wonderful story from the monastery. That is certainly sad news and such a difficult decision to have to go through! My condolences to you all. I remember Hammi very well from my visit to the monastery last year. He Was such a beautiful cat, who really emanated an august presence. I recall when he sat upon a chair in the trapeza and gazed at me, I immediately felt that he was not just some cat but, indeed, a felicitous feline member of the brotherhood, whose place was to simultaneously welcome and keep an eye on guests, in his own quiet and dignified way. I am truly sorry for your loss. Pictures of Hammi always made me smile. Thank you to Hammi for the beautiful example of love that he showed us. My condolences to Abbot Tryphon and the Fathers of the monastery which I hope to be blessed to visit one day soon. Thank you Abbot Tryphon for sharing Hammi’s life with us. Reading your daily posts is truly an inspiration. So sorry for your loss of your dear Hammi. It is so hard to lose a beloved pet. Praying for your brotherhood. I am so sorry for your loss! We ended up with a Norwegian Forest Cat who “came with the house,” when my family moved into a new home many years ago. The house is in the country, so we also had some late night searches for our boy, Lucky. Lucky was also a lover, and yes, do Forest cats ever have a purr box! Lucky also had to be put to sleep, just a couple months ago, so I really to this post a lot. I am so sad for you all, and will be praying for you all, truly. It is a comfort to me that we will see our lovely, furry friends again! I am so sorry for your loss of Hammi. He sounds like an amazing cat and companion. I am so sorry about Hammi. I, too, have lost some furry friends recently, and it hurts every time. I care for a cat herd, and, even though there are many, i know all of them, even the visitors. My herd sends you purrs and head bumps. Thank you for caring for him so well. May God comfort you in your loss! I am more a dog than a cat person, but I love all animals. I have lost several dogs through the years, and while we always have at least one in the house, the ones lost are never replaced. Each is a special and unique member of the home. Animals have so much to teach us and are one of God’s greatest gifts to us! Oh no, I’m so sorry about Hammi! 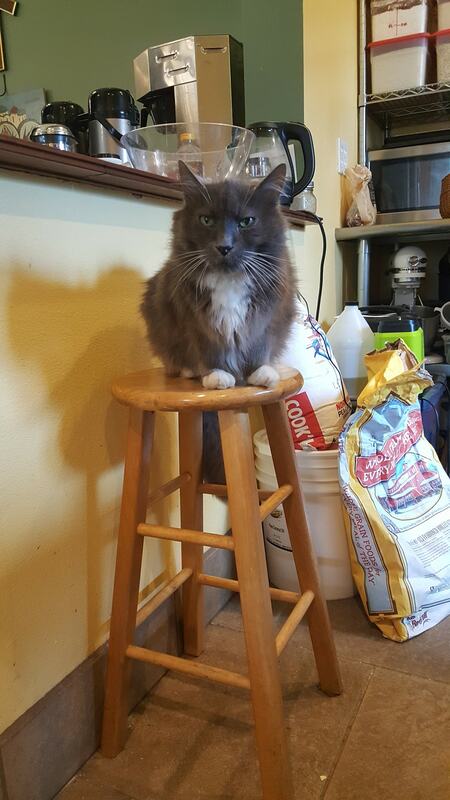 I had recently commented on your 2016 post, “Animals and the Afterlife,” that we’d lost our 13-year-old cat Princess, and you responded with great kindness. I truly believe, as you said in that earlier post, that Hammi will be there waiting for you in Paradise. Thank you for posting this. I am in the same position with my sweet very old terrier, Dolly. May the Lord console you. Each of these 73 comments are a blessed acknowledgment of the degree of loss of Hammi. 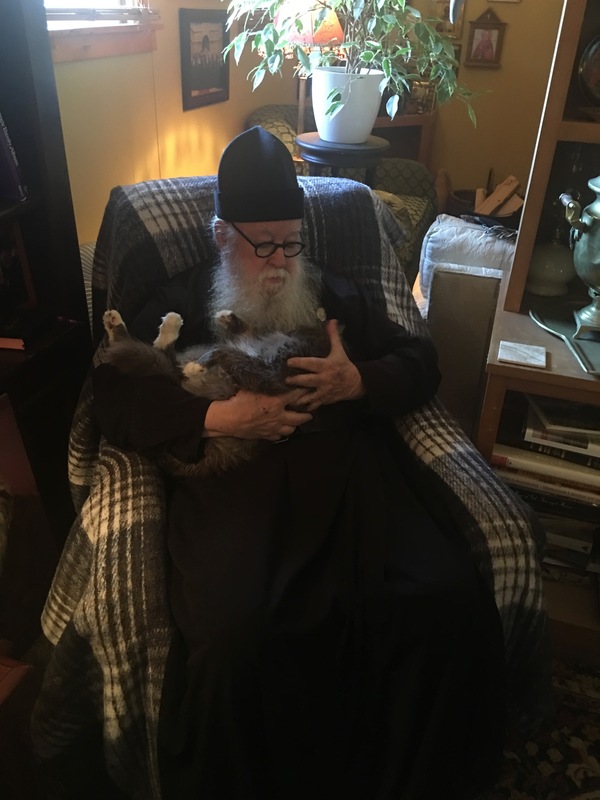 It would be difficult to add too, except to say, that my visits over these many years to the Monastery will be empty when Hammi does not come out to greet me, as he almost always did. My thoughts and prayers are with you and the Brothers of All- Merciful Saviour Monastery. Hammi will be missed by many. Have just now stumbled across this sad post on Hammi, Fr. Tryphon. So sad to see that he is no longer with us, but amazed at his long life. To say that he will be missed is a great understatement. Dear Abbot Tryphon, This was the Most beautiful moment in my life to feel the present of God ‘s house love & peace . 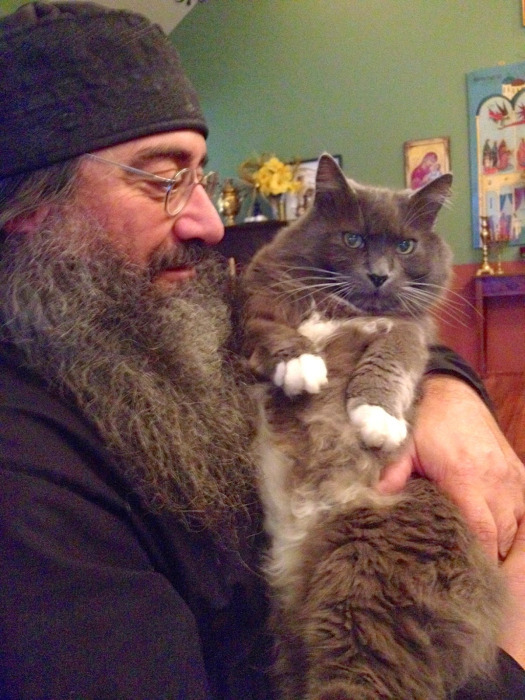 So happy to meet you all at Vashon Island Monestary include the loveble companion cat Hammi. I feel deeply sorrow for the lost of your cat. As I am a pet owner & one day will experience loss of mine. God is the giver of our life and conquers death always & ever after. Amen! Looking forward to see you soon Father. God bless you!